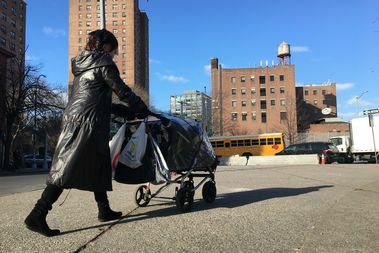 An Orthodox woman pushes a stroller through La Parada, where day laborers usually gather for work. Most took the day off for "A Day Without Immigrants" in protest of President Trump's immigration policy. WILLIAMSBURG — Dozens of immigrant women usually gather each morning at Marcy and Division avenues waiting for cleaning jobs in Orthodox Jewish homes, but on Thursday, the day of a nationwide immigrant strike, the corner was nearly empty. The few women who did come to "La Parada" — the stop — in South Williamsburg, one of the few neighborhoods in the city that sided with Donald Trump in the election, said they could command $15 or $20 an hour instead of the $10 they're usually paid, and refused to work for anything less. "Here there are usually 50, 60 people," said Ana Mendez, 52, from Peru in Spanish. But on Thursday afternoon, she was one of only a handful of women standing on the corner. Mendez had come to La Parada at 9 a.m. and was there until about 3 p.m. asking for $15 and hour. She'd turned down a half a dozen jobs where people wanted to pay her less, she said. Zoila Guannan, 50, said she'd gotten frantic calls from women she usually works for. "They're desperate, they're calling here, they're calling there...They're calling me, but I'm telling them no," she said. "Today is special. We want $20 dollars an hour." She hoped the strike would, "make them feel it," she said. "This was not a normal day for them and for many others," she said, in Spanish. Workers at La Parada, who've been pushing for better work conditions with the Workers Justice Project since 2010, say their cleaning jobs, despite years of fighting for better work conditions, are still grueling. They're forced to work on their knees, they usually don't get mops or vacuums, just a broom and a small piece of cloth. They're exposed to strong cleaning chemicals and aren't given gloves, they said, and some come down with odd skin conditions on their hands. "It's very exploitative, they give you a cloth, on your knees," Guannan said. "Who's going to do that, an American?" Lupe Perez, 50, from Mexico, said she'd been getting jobs at La Parada for the last eight years. "The whole time on our knees. Sometimes they don't even give us water," Perez said in Spanish. Beyond refusing to work, Perez said she and others weren't shopping or buying anything during the day to show the other kinds of economic impact immigrants have in New York City. "We don't have papers but we're spending money in this country," she said. Passing by the unusually quiet corner on Thursday afternoon, 21-year-old Shevy Kown, 21, an Orthodox woman pushing a baby carriage, said an exterminator had called to cancel on her because his workers hadn't shown up. She comes to La Parada once a week for help, but her day hadn't been greatly impacted by the strike, she said. Still the strike might help her neighbors realize how much they rely on immigrant labor, she said. "They have a big impact on our lives cause they help us all day," she said, adding she'd noticed quiet construction sites and fewer food deliveries that day. "People get to realize we really need their help for all kinds of services."